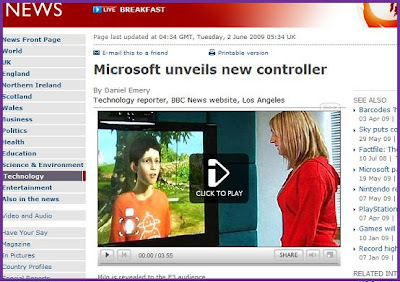 Watched the video on the BBC website of the reveal on Project Natal, which enables players to interact with a character on screen in a very natural way. The film shows a woman interacting with a boy character "Milo" on screen. In the course of the short film, she picks up some goggles, dabbles in the stream and passes a sketch of a fish over to Milo. It's an impressive glimpse into the future possibiities, although it made me wonder just how interesting interacting with a robot boy, dabbling the hands in virtual water and sketching fish actually is, compared with talking to a real person, dabbling in real water etc - and I speak as someone passionately devoted to virtual worlds. One of the best things about Second Life is the fact that the people you meet are real people with real lives and real emotions - but more than that - real experience and a real history. For a virtual character to be at all interesting they need some backstory and something to entice you to be interested in them. If the boy had been from the 15th century, or the 30th or from a lost tribe or far-off planet... it would have been just as exciting, but more interesting. I also worry a great deal about the future of our children, interacting with characters who appear to be normal chidren but are not. I believe that human beings are designed to model themselves on the people they interact with. Our psychology is going to take some time to catch up with a world in which some of the people we interact with are not real people, but robots. In fact it may never do so... it is said that the reason we find it so easy to immerse in virtual worlds is a good evolutionary tactic: for hundreds of thousands of years it has been essential to assume that anything we see happening to us IS real. If you take two minutes to decide whether that spear winging its way to your head is real or not... you're dead. So your brain assumes it is real and reacts accordingly. This is the reason I felt the same vertigo crossing a virtual chasm as I would crossing a real one... and why it will be easier and easier as the technology develops to regard the Natal's Milo as a real boy. It seems to me probable though, that this boy will adhere to a certain set of rules about ethics and morality, which real boys tend not to do. The most exciting uses must be educational for these things, and yet that always seems to take a back seat to entertainment. I think that play is an important thing for children and adults, and that we should encourage people to be playing as much as possible... what I would love would be the chance to make games and play which are truly educational and inspirational... real education and not the ersatz one which schools dole out in ever-smaller chunks to an enforced audience. We need to be careful though. My experience with home educated children and my own has proved to me that the most important thing is the interaction between a loving adult and the children, and how responsive that person is to the child. If television has become the default nanny for a lot of children, then an interactive boy may be an improvement on that. However, neither the television, nor the astonishing Milo, should ever be a replacement for a loving and engaged adult, I think. It is too obvious to me that this could easily be the case, and very quickly, if we are not alert to the seductive power of immersion. Maybe the introduction of other real-life attribute might solve the problem: sulking, telling tales, getting grumpy? Otherwise Milo may quickly become the preferred friend of all children, everywhere.